Several of the questions on the ACT Math Test cover plane geometry (what you think of as “just plain figures,” like triangles, circles, quadrilaterals, and so on). Here are a couple of questions to get you started. A sailboat has a sail that is 16 feet high. The base of the sail measures 12 feet. 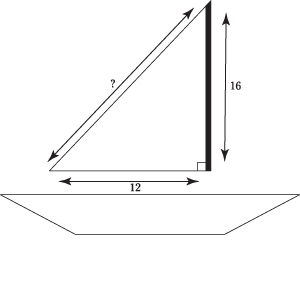 What is the measurement in feet from the bottom-left point of the sail’s base to the top of the sail? Janet is filling in a patch of lawn with sod. The patch is in the shape of a parallelogram. The length of the patch is 8 feet and its width is 6 feet. One of the interior angles measures 120 degrees. How many square feet of sod will Janet need to completely fill the patch? 1. The correct answer is Choice (C). The problem tells you that the height of the sail is perpendicular to its base, which means the sail forms a right triangle. The question asks you to find the measurement of the hypotenuse of that triangle. Before you call on Pythagoras and his theorem, check the ratio of the triangle. It’s 12:16:x. Notice that 12 is 4 times 3 and 16 is 4 times 4. Looks like a 3:4:5 right triangle! Multiply 5 by 4 to complete the proportion. The answer has to be 20, which is Choice (C). If you chose any other answer, you were just guessing. 2. The correct answer is Choice (G). The number of square feet of sod is the area of the parallelogram. The area of a parallelogram is bh. The base of the garden is the length of one of its sides (say the longer one measures 8 feet.) Because the garden is shaped like a parallelogram, you can’t assume that the measure of its width is the 6-feet measure on the other side. To find the width measure, draw a parallelogram that slants to the right and create a right triangle by drawing a line from its top left corner that’s perpendicular to the base. The angle your new line extends from measures 120 degrees. Opposite angles in a parallelogram have the same measurements, and all four angles add up to 360 degrees. That means the two smaller angles of the garden measure 60 degrees and the other large angle measures 120 degrees.